Tattered Musings: Fig. 52 Handbuch Der Schiffchenspitze, band 2. I have finished another of the figures related to fig. 51 in Tina Frauberger’s Handbuch Der Schiffchenspitze, band 2. I completed figure 52 yesterday (12 November 2008) and would like to share it with you. Though this is only my second project since returning to tatting and I am not very pleased with some of my technique I am pleased with the overall piece. I did force myself to use a bridge and a split ring in this project so this was done CTM. The bridge and split ring are to the left of 10 o'clock. I need to work on those, but these are the first to appear in a finished project by me. The additional instructions for the additions to fig. 51 are relatively straight forward. You have a picture of the final motif, a couple of statements and the actually notation. The best I have been able to determine is that VBBG is used where I would use some version of "Chain" as I think "sheet row" must be. This could very well be a vestige of Tatting’s development starting with rings and the true chain coming later. Though by 1917 when the first volume of Schiffchenspitze came out chains were certainly more than than connectors between the rings. < = Anschürzen which other references translate as join. What is fascinating to me is how Tina Frauberger notates a floating ring. Here are her instructions for the fig. 52 addition. I was not going to do fig. 53 at this time. 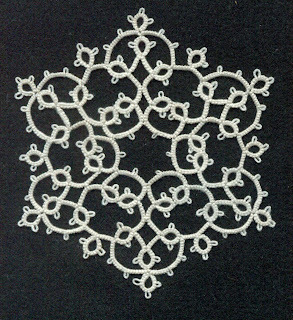 I went through all my tatting books and online patterns looking for my next tatting project. I had decided I would like to do a cross by Mary Konior. In trying to choose a cross I noticed that one of the crosses had some elements that reminded me of fig. 53. So, even though I planned on waiting to do fig 53 and given that particular Mary Konior cross was not one of my first choices the similarity in technique between the two makes me want to do both so I can really understand this design approach. I hope to start Fig 53 today, my shuttles are wound, but I really have not gotten to say what it was I was really planning on saying today. Hello Pat. I am very interested in purchasing the book that you refer to in this post. Someone on E-tatters gave me a web site address that carries the book, but the site is in German, and I was wondering if you knew of a site selling the book that I could correspond with in English? Any help would be appreciated.Thanks. I am sorry the German site is the only source I know of. It is good to see you are back and tatting again. Regarding the book. I was gifted a copy of the reproduction in September that I believe was bought through that German website in May. So I think they are able to communicate in English somehow because those who gave me the book were English speaking tatters. I cherish the book and think there's some awesome designs in it. Hi Pat. Just wanted to let you know that I ordered the book from Agnes Focke from the German site. Thanks for your help. I expect it any day now. Congratulations Tina, I am so glad that Agnes Focke and Christel Wutzmer are still able to provide the book. It took a long time and research for me to get the book and I was not disappointed. I have been and am still very much in love with the book, though I have not forsaken my first love, Tatting with Visual Patterns by Mary Konior. I know you will love the book. Let us know what you think of it, perhaps also on one of the e-groups. I mainly watch TatChat, tattingroundtheworld, and S_NTatters lately, plus a couple of others.